That’s how the conversation began. 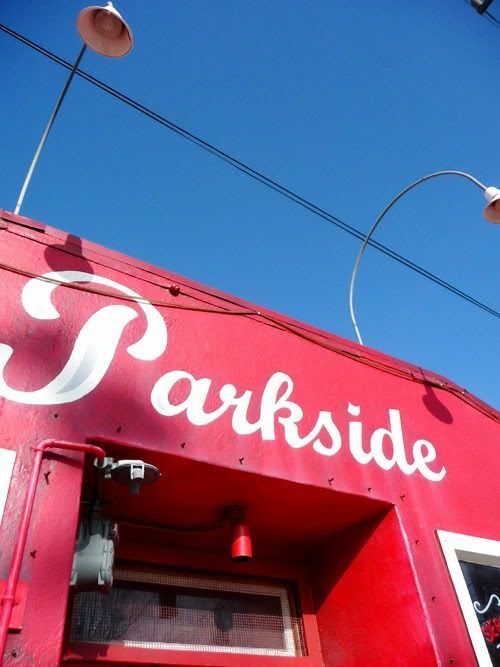 To be clear, the “bar” was actually a venue called Thee Parkside. 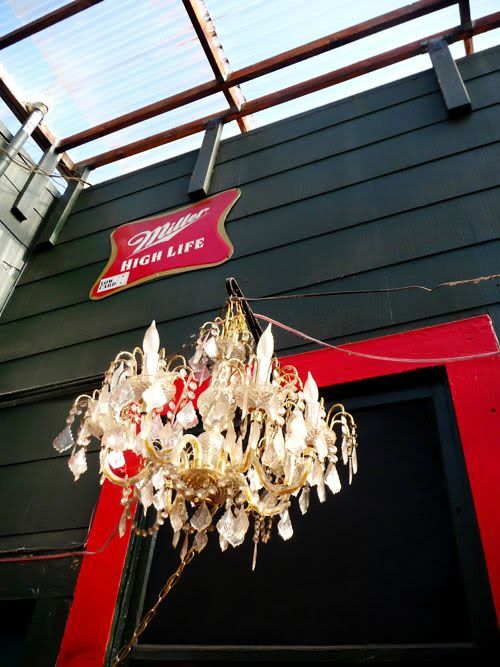 It is sort of a bar/pub with a great outdoor patio area — not some dark, grotty hole-in-the-wall. I’ve been to many a rock show there and in the day time it has a very different vibe. 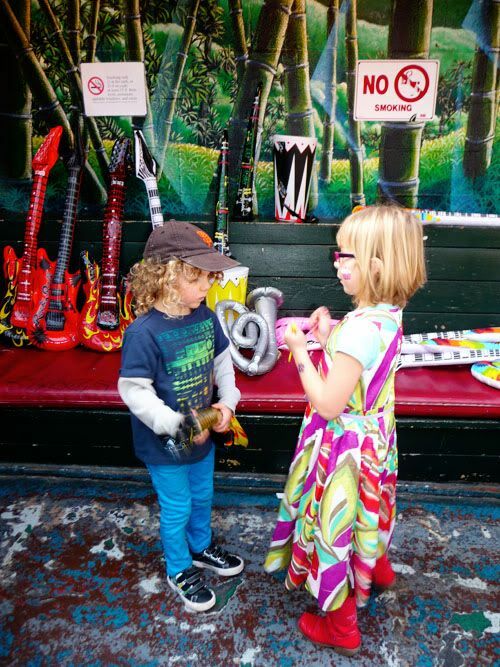 So when my friend Toria asked me if I thought it was weird to have her son Griffin’s 5th birthday party there, I had to pause….it was definitely unconventional! But it was also kind of genius. Allow me to explain. In this day in age the birthday party has evolved a bit. When I was younger it was more of a drop off scenario. Parents rarely hung around and your younger brother or sister wouldn’t even DREAM of crashing. Nowadays parents actually like to socialize with one another and it seems more often than not little siblings show up too. As my friend planned the party, she knew she wanted to do something fun/different and appealing to both parents and children. 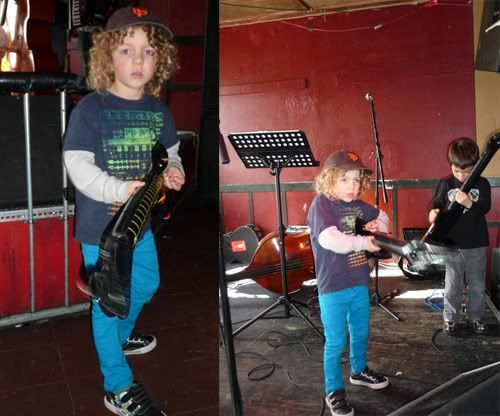 Griffin loves music so the idea of a rock-n-roll bash seemed just the ticket. 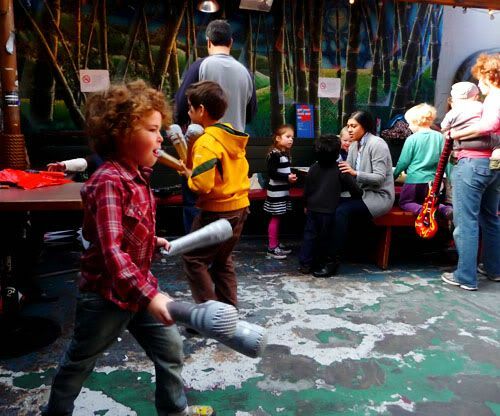 I’ll be the first to admit that having a children’s party in a pub is very “San Francisco.” We don’t have the luxury of large backyards, so parties call for creative measures. Let me assure you that Toria executed it brilliantly! The place was shut down for the party (so no errant riff raff was wandering around) and the staff was extremely enthusiastic about the event and ensured it was utterly kiddo-appropriate. There were so many fun details I thought you guys would like to see how this Indie Birthday Party all came together. 1. 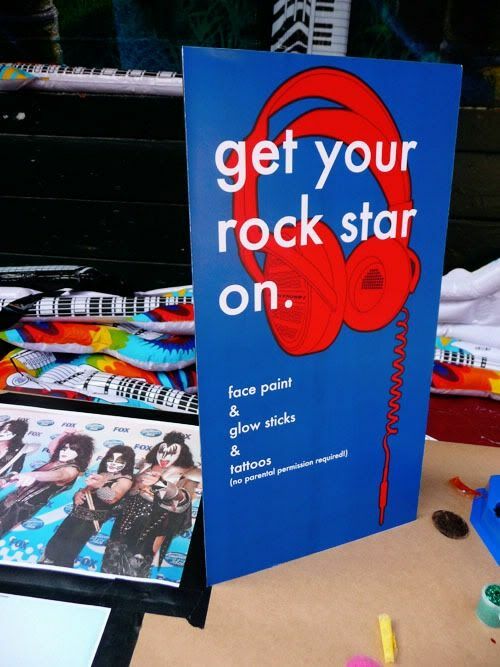 Embrace Your Inner Rock Star! 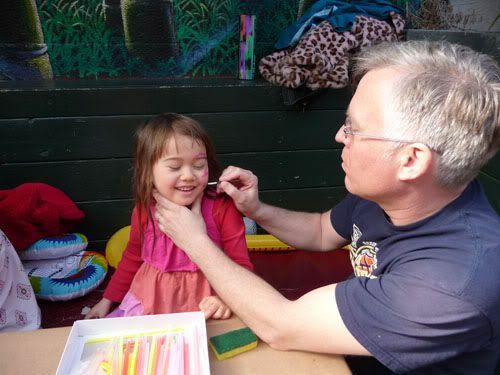 The party began with a special table where all the kiddo’s could apply fun temporary tattoos and paint their faces. Lots of glittery stars, butterflies and lightning bolts made an appearance! You could take it even further and add costumes or wigs to the mix. I love the colorful signs Toria printed up for the various “stations”. 2. 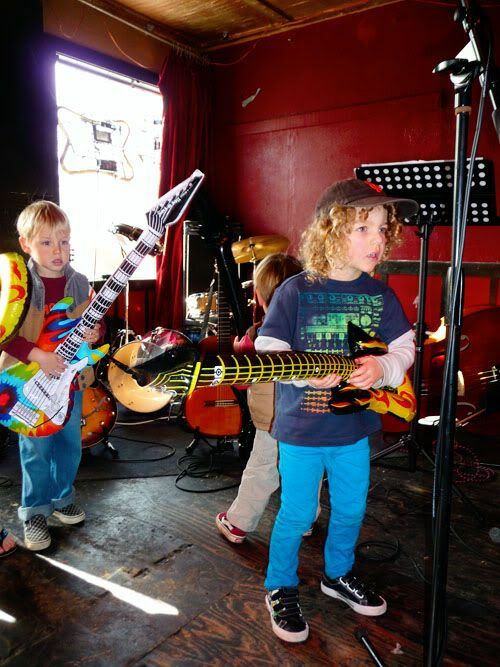 Encourage the Kids to Rock Out! 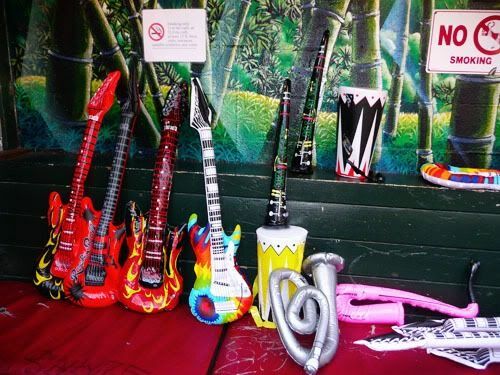 A collection of inflatable guitars, banjos and other instruments were available for all the kids. This was AWESOME. They loooooved it! 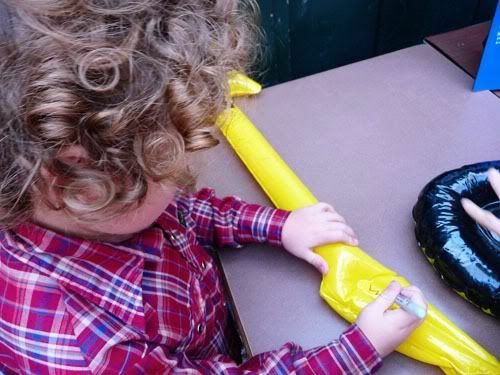 Toria cleverly had paint pens so kiddos could write their name on “their” instrument. More of a lead singer? We’ve got you covered! 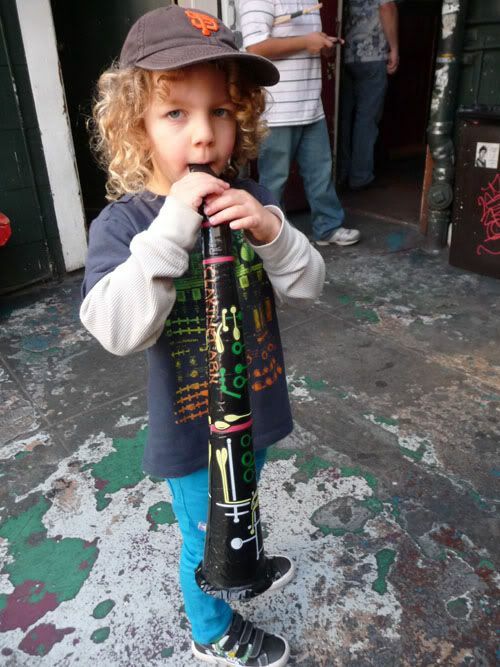 Griffin’s dad is a musician so he and some friends got together and formed an impromptu band that played loads of kid-friendly tunes—from They Might Be Giants and the The Beatles to fun standards. All the kiddos were invited on stage to “jam” with the band. Griffin took center stage and led the kid’s in a fantastic round of air guitar. It was SUPER cute! 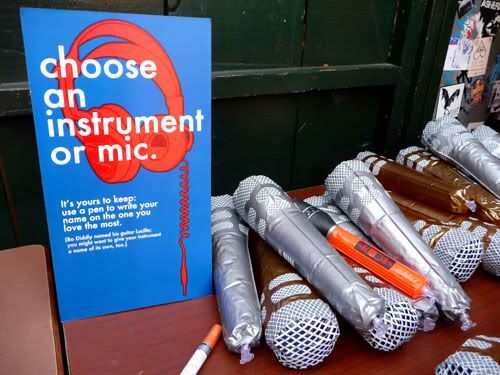 There were also tambourines and those percussion drum box thingies for the kids to bang on as well. 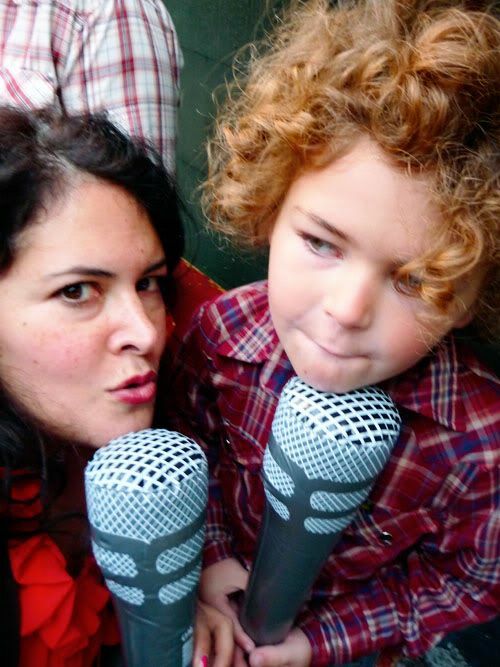 Little Santiago with the “keyboard” killed me…. 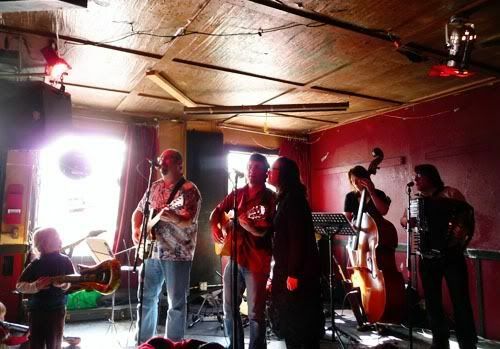 Wolfie and Greg taking a breather….hey, it’s hard work rockin’ out! Rockin’ out makes you hungry, so food is a must! 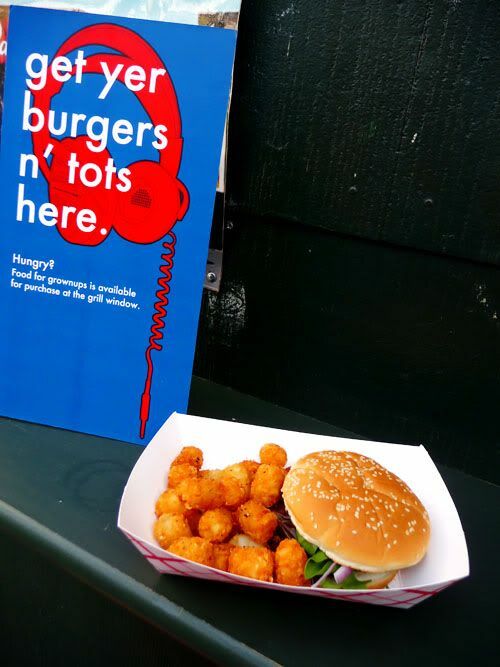 Toria had tasty burgers and tater tots for everyone and can I just say these were the crispiest most deeeelicious tots EVER?? There was also a table of kid-friendly healthy snacks like apples, carrot sticks, cheese and crackers. In the end, a really fun time was had by all. The parents felt like they had a little afternoon out (yes, the bar was serving drinks) and the kiddos REALLY had a blast. 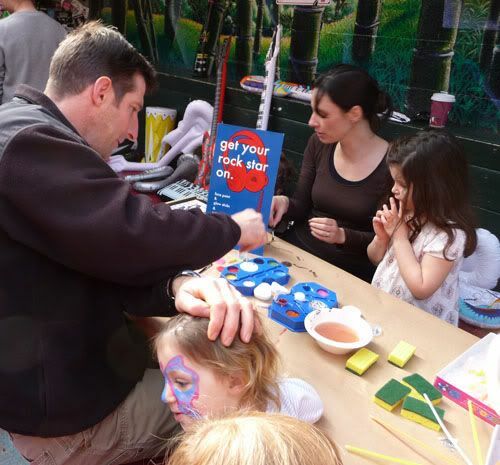 Just goes to show ya that with a little creative thinking, kid’s and parents can both have a harmonious time at a birthday party! 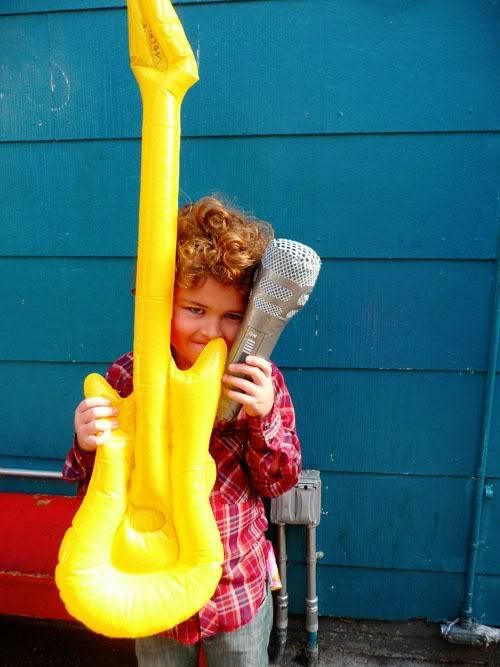 I hope you got some fun tips for throwing your own rockin’ birthday bash! You could easily do this kind of a party at your house (especially if you have a big back yard!). If you live in a city like we do, and back yard space is not as readily available, consider holding it at a park or community center. 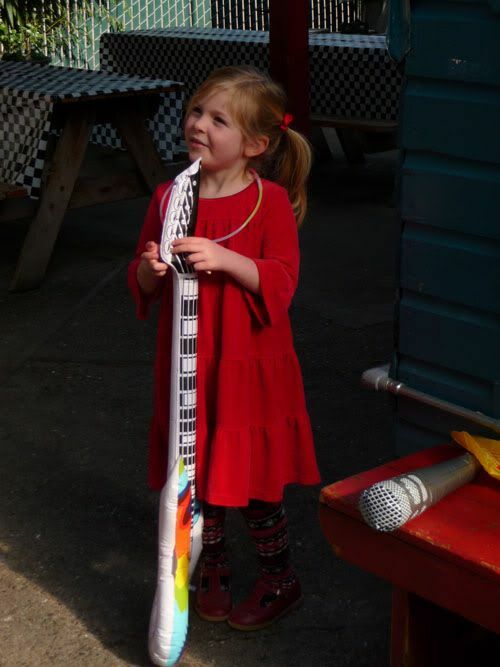 Or go big and find a family-friendly pub like Toria did! By the way, Toria has an awesome blog called “Tiny Reads” which is all about cool kid’s books. You should check it out for sure! 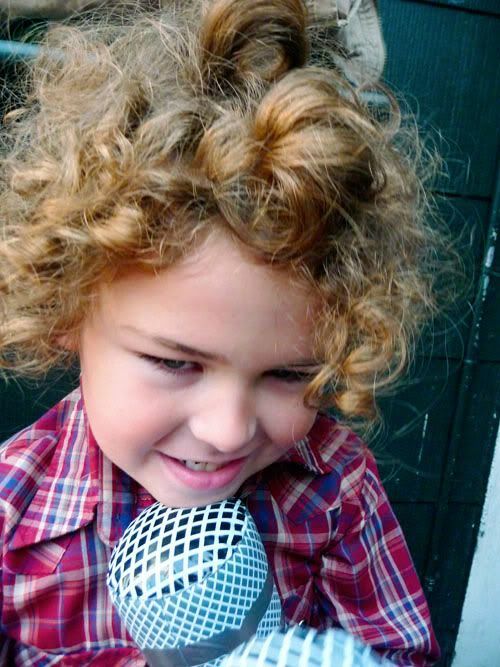 Later this afternoon I’m going to have a list of my Top Tunes for the Most Rockin’ Kiddo Dance Party! So c’mon back. 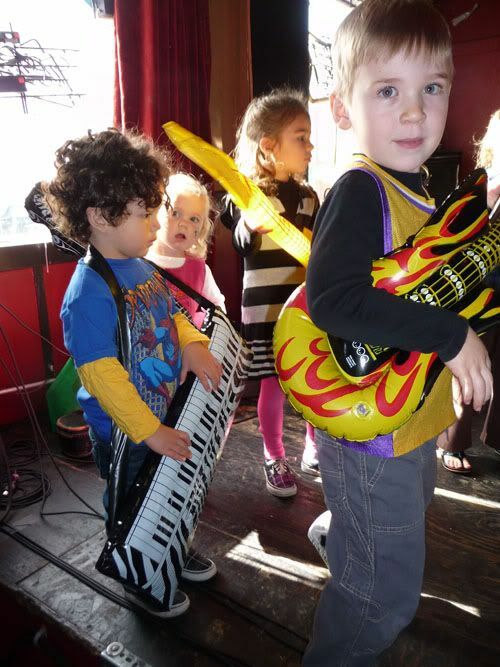 Tagged with birthday party, dance, disco, DJ, kids dance party, rock band, rock-n-roll party. fabulous! i wish i had been invited! stella went to her first daddy daughter dance and rocked out to hr fav song “single ladies” by beyonce! the video was too much! so SF..(miss u sanfran) & just so great. Thanks for sharing! i spy a little western shirt from auntie freckle!!!!!!! 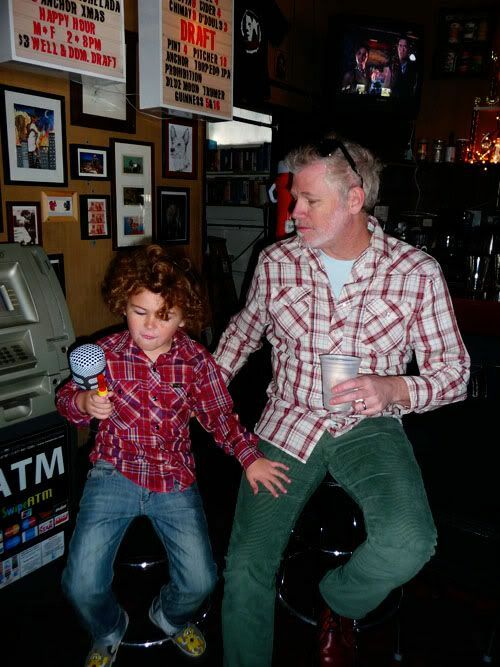 boy does he look ever so handsome, and i love the pic of wolf + daddio, such cute boys! that party is perfection. 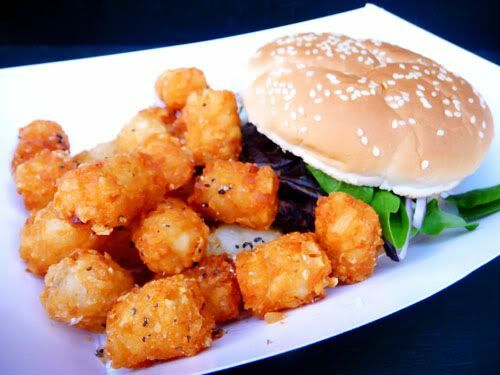 burgs and tots! i want in!!!!!!!! 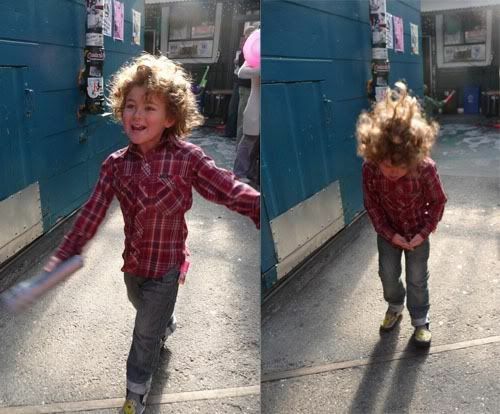 Miss Alix, your son is adorable. And that’s my kind of bday!! That place reminds me of The Station in San Diego. Um, this is completely adorable. Would she mind if I took the whole party idea and applied it to me as an adult? This is amazing! I am a bassist, and in a few short weeks a mom! I hope I can have such an awesome party for my little man in a few years! Too cute! I love it! how cool! you’re going to have a musical bebe fo sho!